Ruquiayah was born and raised in Chicago, Illinois. She moved to Arizona and settled in the City of Surprise. 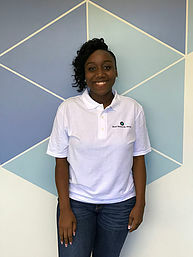 she is currently pursuing her Bachelors in Social Work at Grand Canyon University, which She plans to utilize her degree with community outreach programs for at-risk youth, and have a career working with foster/adoption care agencies. She always had a passion for children in helping with their education. In her spare time, she enjoys reading a good novel. She also enjoys tutoring third graders to help with reading comprehension and fluency.